Hello, fellow Daredevil fans! 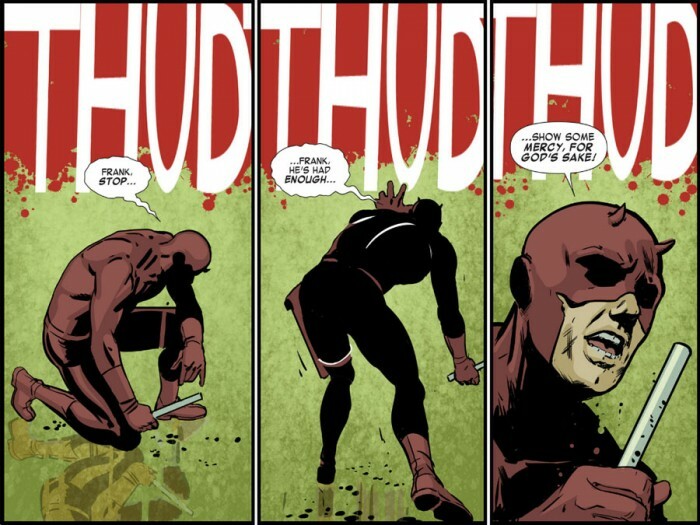 Time to review the last installment of Daredevil: Road Warrior #4. I just got an automated email from Marvel a couple of hours ago that read “Subscription Notice: Daredevil: Road Warrior Infinite Comic Has Ended” and I have to admit, it felt a little sad. Peter Krause has done a fantastic job providing the art for this series – beautifully colored by John Kalisz – and he will be missed. I would love to see him on a future project similar to this one. Fortunately, Mark Waid will be back tomorrow, along with regular team mates Chris Samnee, Javier Rodríguez and others, but it will be difficult to go back to reading Daredevil monthly after having been spoiled like this! My overall impression of Daredevil: Road Warrior #4 is that it provided a really interesting and well-balanced end to this series. There was some concern on my part that, considering where we left off, there wouldn’t be enough room to get to the end without rushing to the finish line, but the pacing was excellent, as is almost always the case with anything plotted by Mark Waid. Really, I should know better than to doubt him at this point, but you always wonder just how he’s going tie up the loose ends. The previous chapter ended with Daredevil and his new adaptoid look-alike friend arriving at the Mad Thinker’s base of operations. As was very clearly evident to everyone but Matt himself, the odds were not in his favor. The Thinker is presented as a potentially very formidable foe, and the way Daredevil has to manage the situation relies on a great deal of cunning. This is not the first time that Mark Waid has put Matt’s respectable intellect to the test, and I’ve always appreciated seeing him rely on more than acrobatics and heightened senses. The way this story plays out, and without giving too much away, we also get some insight into how Matt forms attachments to people, and how he views his fellow man. Within the space of a few panels, there are some great heartfelt moments that I thought gave additional weight to the entire storyline. I would be remiss not to mention the ending. I don’t think I’m giving too much away by revealing that Matt does get reunited with Kirsten, and the way it’s done is pitch perfect. There is a clear sense that, over the months and between panels, Kirsten and Matt have come to know each other quite well, enough so that Kirsten knows what Matt’s preferences are, and makes an effort to show him she cares. And, the simple yet profound thing he asks of her is both very sweet and so very Daredevil at the same time. It was a nice, quiet moment. I’ve already mentioned that artist Peter Krause will be missed, and I particularly enjoyed his work in these final two chapters. His style has a lightness to it that I really like, and the overall look is beautifully enhanced by Kalisz’s colors. As I mentioned in my previous review, he has a great eye for anatomy and draws a perfect Daredevil. Well, I hope you guys enjoyed this story as well, and I will see you back here tomorrow! Minor Minor Spoilers ahead: Best installment yet. And I continue to be awed, not just by the writing and art, but by the technical brilliance. 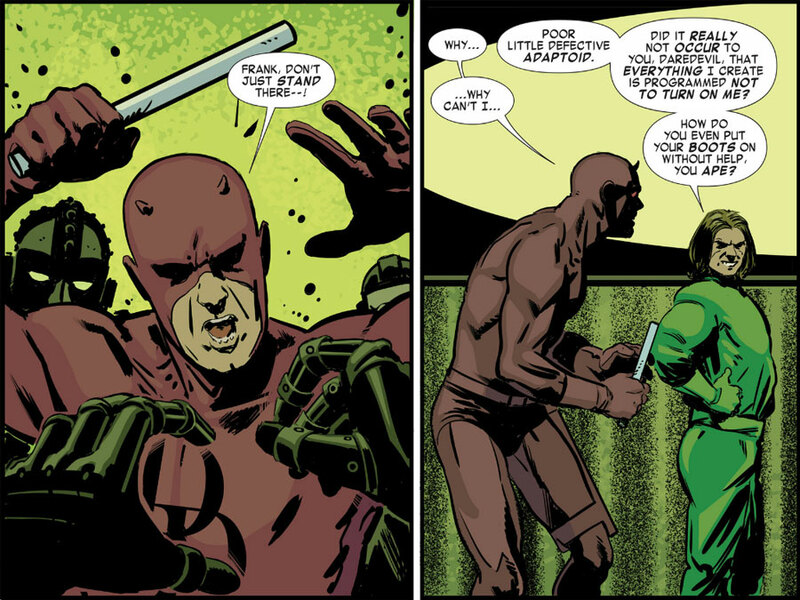 The last panels, when Matt activates the power lock made me think for one instant that I was watching an animated clip. The police station scene… I think Matt probably found it a relief to be able to establish his bonafides. And then… a WHOLE danged MONTH for the next part. Dang it! Spoilers will be presented here. I really enjoyed what the tools that the infinite presentation has to offer as a digital reading experience. Plus, Krause’s Daredevil reminded me of Lark’s run and I’m pretty big fan of that look. The colouring was well done too. A couple things that I didn’t like. First, I spent $12 for this and I don’t think I got $12 entertainment value out of this story. An Image tpb at $9.99 collecting 5-6 issues of a brand new series is fairly common place now. A recent Marvel tpb of a new series, the Superior Foes of Spider-Man, retails at $16.99. This collects 6 issues. I think $8 would of been my ceiling for this, but this was my first infinite comic test and I wanted to try it out. I won’t be trying anymore at this price at all. It would have to take a Frank Quitely or a JHW3 type of artist for me to throw cash at the screen. A major critically acclaimed creative team. The story itself was average at best. The first 2 parts were done wonderfully right up to the twist. The wacky Silver Age-type twist was a little too much for me. Without expanding too much on that, let’s just say that I’m not a fan of androids that can change appearances at will and copy tools as a bonus. The distraction trick was very unoriginal too. “Hey, you don’t have a heartbeat. What? !” In my opinion, this is not really high on the creativity scale. And certainly not was I expected from the caliber of this writer. So, the twist and the ending really made the overall story fall apart for me. But not all is lost! I’m off to the shop within the hour. The “real” Daredevil awaits! I agree with CBL. The first couple of issues were good, teasing us with the mystery and making us want to find out what is going on. The last two issues were kind of ho-hum for me – a bit flat. Having the antagonist be an android of an arch villain was a bit, well, comicbook-y. Fletch, Thinker wasn’t an android. When DD said that Thinker had no heartbeat, he was telling “Frank” a lie so that he would bypass his programming and attack the “android Thinker”. DD even says something to the extent of “I can’t hear over the sounds of breaking bones and gurgling lungs”. I have to say that having DD comics turn up every week is fantastic. Having them appear electronically is less so, I found myself trying these stories on a variety of laptop browsers and mobile phones, and just didn’t like the experience as much as on paper. I’ve still not worked out if it was the Marvel Site but the execution was not a patch on the Thrillbent site, which is smoother and more consistent, or the fact that I’m now reliant on Marvel or keeping my phone forever, if I want to go back and read them. As opposed to my beloved boxes and plastic covers! On the plus side I like the options electronic comics provide, overlaying pictures blurring images and the like. As for the story it ticked over , with a few smart twists and a few corny ones, gorgeous colours and art, not a classic but hey ho!. I’m now looking forward to reading #1 in the next few minutes.